Every now and then I will get someone who accidentally presses one of those reply links thinking they're leaving a new top-level reply for the post. That might seem like a silly mistake, but it helped me to realize that if the comment reply link included the name of the person you're replying to, it would be more difficult to make that mistake. We should do anything we can to remove ambiguity. Besides, personalized comment reply links are just plain cool. // Replace Reply Link with "Reply to &lt;Author First Name>"
This code also takes into account the fact that some people might use more than a first name when they leave a comment. Having their whole name in the reply link would just look weird, so the code only uses the first name. Please note that the .' '. is added to get a space between the your "Reply" string and $author variable. // Replace "Cancel Reply" with "Cancel Reply to <author First Name>"
Genius! I also love the simplified comment form on your site now. Such a great idea, Raam! We’re going to use this everywhere. I’m glad you like it, Matthew! 🙂 It definitely helps make the comments section more friendly. You don’t need to paste anything into single.php. A very great idea. Thanks for sharing this Raam. This is great, thanks for the code and idea. First of all, congrats for the idea and the code! I got to your website, after I tried to find a way to translate the “Reply” button in my language. Your post is way more useful, but I still have a problem, because I want to translate your “Reply to” feature to “Răspunde comentariului făcut de”. In Romanian it means “Answer to the comment made by”. Would you please help me to achieve that? The line that you said you tried changing is the correct line to change, so I’m really not sure why it wouldn’t be working. This really is a neat script, I was on the lookout for something just like this. Please note that the .’ ‘. 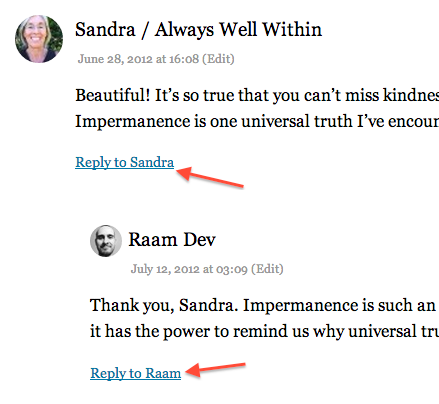 is added to get a space between the your “Reply” string and $author variable. Hentiki, thanks so much for sharing your tweaks for use with translation. I’ve updated the post to include your suggestions. I have changed most of the template to russian in the comment.php file, but after one has commented and someone would like to reply to a comment there is one “Reply” button that I can´t seem to find and change. I have looked in all the .php files in theme editor and I can´t seem to find it anywhere. Someone who knows? I want to translate only button “Reply” feature to “Ответить”. In Russian it means “Reply”. That text is generated by WordPress in the `comment_reply_link()` function. You might want to check your theme’s `functions.php` file and search for that function. Then you can tell the function to use a different “Reply” text like this. You should be able to fix that by modifying the code to support translations (see the “Supporting Translations” section I appended to the post). Would it be possible to modify this code to only display the answer link to the post author ? Thanks for this great code and for your help. I’m not sure I understand your question. What do you mean by “answer link”? Wich seems to be the only way to recober author ID outside the loop. Thesis uses its own theme framework, so unfortunately it will require custom code from the Thesis developers to make this work. I suggest contacting them to see how you can achieve this. Like other commenters here, I think the idea of personalising the Reply link is a very good one, particularly in terms of removing ambiguity. I get the impression that quite a few newbie commenters don’t really grasp what the link actually does. 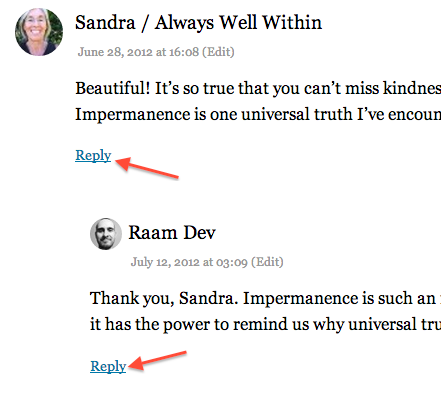 Is there a simple way of using your stripped-down comment author’s name to personalise a Cancel Reply link? I’m customising Twenty Twelve on a local server, and in the child comments.php I’ve had the line “’cancel_reply_link’ => ‘Or click here to cancel a reply to this commenter’,” (which immediately follows “Leave a comment?” ). It seems silly to refer to “this commenter” when the Reply link itself is personalised, so I’ve been trying out my next-to-nonexistent PHP skills with versions of “’cancel_reply_link’ => ‘Or click here to cancel a reply to ‘ . $author,”, but without success. For the time being, I’ve changed the line to “’cancel_reply_link’ => ‘Or click here to cancel this reply’”, which is OK, but if you know a simple way of personalising the Cancel Reply link, I’d appreciate a note below. Incidentally, if any readers of your post wish, like me, to add a question mark (or some other text) after the stripped-down comment author’s name, the line “$link = str_replace($reply_link_text, ‘Reply to ‘ . $author. ‘?’, $link);” works — and is probably the closest I’ve ever come to writing PHP, even if it was achieved only by brute-force trawling through various permutations of full stops and commas. As a further incidental, I’ve enclosed the question mark in a span, so that the question mark ceases to be displayed on hover. I have an another question — which might be a bit trickier. Can you figure any way to switch between a threaded comments structure and a flat comments structure on a post-by-post basis in WP? The only way I know how to do this is to set up WP as a multi-site, with one of the multi-sites enabling threaded (nested) comments under Settings > Discussion, and the other one disabling it. For my part, I think a threaded comments structure is preferable for many types of post but a flat comments structure is best for posts on topics that are inclined to devolve into off-topic arguments between commenters. I have no idea how you might go about changing that setting on a per-post basis. You might be able to “fake” the flat layout by using some CSS styles to undo the indenting and then hide the “Reply” links on each comment; that would essentially give you a flat layout even while comment threading is enabled. You could then write some code that only applies those “flat CSS rules” when a post has a specific Custom Field. You might try posting your question in the WordPress.org Support Forums to see if anyone else has any suggestions. That’s a good idea. Thanks, Raam. In the flat-comments child theme of Twenty Twelve I’ve been working on, I’ve already hidden the comments’ Reply links via CSS, and I could try to figure out which selectors control the indenting and disable these via CSS on a post-by-post basis, presumably by calling a second stylesheet for a particular post via the Dashboard’s Edit Post screen (if that’s possible), or by specifying in the one-size-fits-all CCS file that the “hide comment Reply link” and the “flatten comment structure” code applies only to a set of posts with specific ID numbers. At the moment, many of WP’s selectors remain a black box to me but bit by bit the box is opening up its secrets. Nice function, works ‘out of box’. I’m not quite sure what you mean by “get a comment reply for ‘level 3′”; what are you trying to get? If the settings are to have threads 3 levels deep, then there is no ‘reply’ link for a comment at level 3. You have to adjust the code to do that. And, after mucking about, I figured that out. But I figured out that too. I’m glad to hear you figured it out, Rick. Care to share what you did? I wasn’t aware of that issue with the comment form losing the comment content if you forget to fill in the required fields. Thanks for the heads up. That’s a must-fix IMO! Did u know how to change the class ” comment-reply-link ” ? Thanks for this Raam. I love it. Is there any chance you could show how I could make a little change? I’m using comment_reply_link on my site but the problem is that when i try to reply a comment, reply doesnt appear below the comment that i reply. It just acts like a new comment. Can you help me if you know the solution? Thanks. Thank you very much for your helpful tips. Can you please tell m e when I put my website link in social media or any where, preview image comes blank. How can I fix ? Hi Janet, I suggest posting your question on the WordPress Support Forum. Hi Raam, when i try to add this code i got error. Need to change anything themes file? I’m not sure. This was written a few years ago, but as far as I know it should still work. I couldn’t find the answer on another post on your site, so I will ask the question here. Can you write a post or share a link to your code that you used to make the Add a Comment button? Also, a suggestion on your post. Since you are showing “to: author name” visually, you need to remove the ARIA label from the link or else screen reader users will here it twice. When it should really be. The “Add a Comment” button is part of the Independent Publisher theme that I’m using. Regarding the ARIA label: that’s actually a bug in the Independent Publisher theme! Thanks so much for reporting it. 🙂 I’ve opened a bug report for that and I’ll get that issue fixed for the next release of the theme. Does that plugin allow you to show the name of the person in the reply link, as this article explains? Looking at the screenshots of your plugin, it doesn’t look like it does. Eliseo Mendez mentioned this Article on plus.google.com. Comment History with Get Recent Comments Plugin — My Dad and I have been going back and forth quite a bit in the comments on a recent post I wrote about Consumption. Coding a style changer for WordPress 2.0 — I'm sure there are plugin's that take care of this function, however I decided to hardcode this right into my WordPress theme. Modifying the WordPress (more…) link — I found the more feature of WordPress to be very useful, however I wanted to change the link that was displayed.